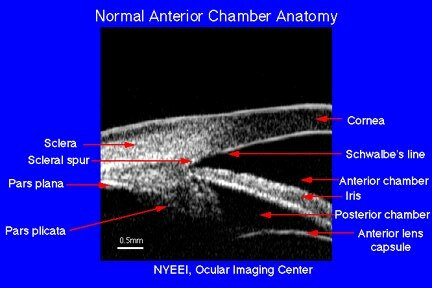 Assessment of the anterior chamber angle (ACA) is commonly performed by indirect gonioscopy. However, gonioscopy is a relatively subjective method of examination. Recent imaging techniques have made objective assessment and grading of ACA possible. First developed by Charles Pavlin and Stuart Foster in 1989. 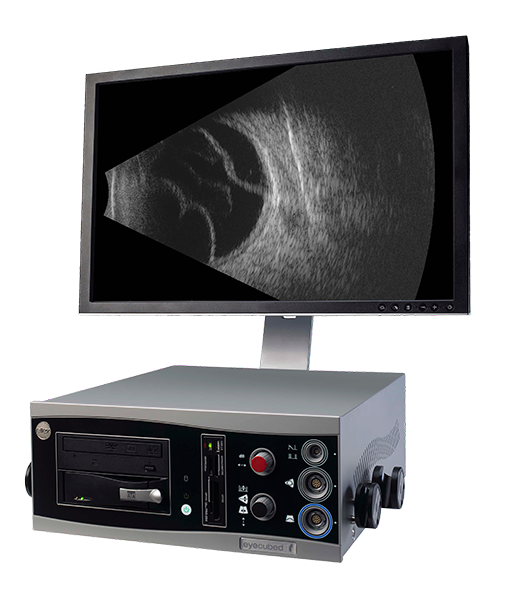 Uses high frequency ultrasound (50-100 Mhz) for anterior segment imaging (compared with 10 MHz for posterior segment imaging). A computer program then converts the time delay of these sound waves into a high-resolution B-scan image. A 50 MHz transducer emits sound waves which pass through ocular tissues reaching a penetration depth of 5.5 mm. The waves are reflected back from tissue interfaces and detected by sensors in the probe. The Ellex-Eyecubed system available in our hospital is a 40 MHz wide-field anterior segment UBM. On UBM, the first structure visualized is the cornea. The Bowman’s membrane is seen as a first dense echo. The stroma shows low irregular reflectivity. The Descemet’s membrane is seen as a dense, highly reflective line. 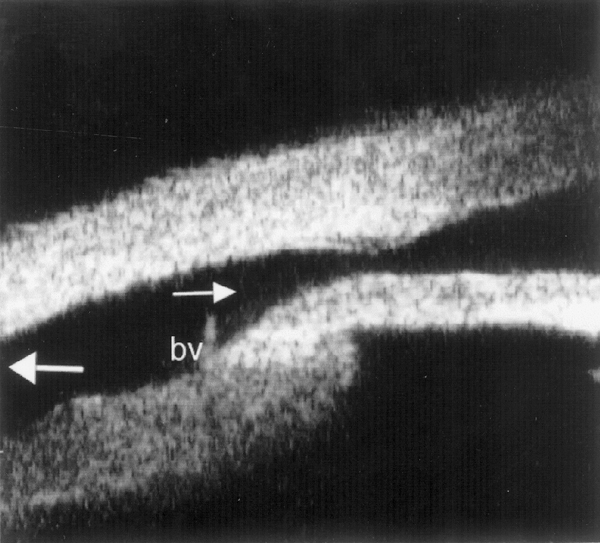 The corneo-scleral junction is identified on the basis of low internal reflectivity of the cornea compared to sclera. The AC is visible as an echo poor area between the cornea and iris. The iris is seen as a flat, uniform echogenic area. The iris and ciliary body converge in the iris recess and insert into the scleral spur. The area under the peripheral iris and above the ciliary processes is defined as the ciliary sulcus. In general, the iris profile is straight, compared to the anterior bowing in angle closure or posterior bowing in pigment dispersion. The ACA can be visualized by orienting the probe radially at the limbus. The scleral spur is seen as a small echogenic dot when the line between the sclera and ciliary body is traced to the AC. 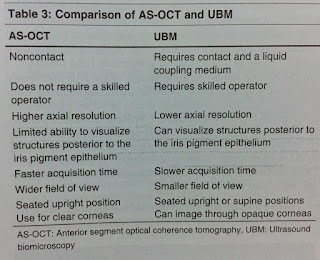 UBM image quality is dependent on the examiner’s skills. In order to attain good quality images from the ACA, the images must be acquired perpendicularly to the structures of interest. 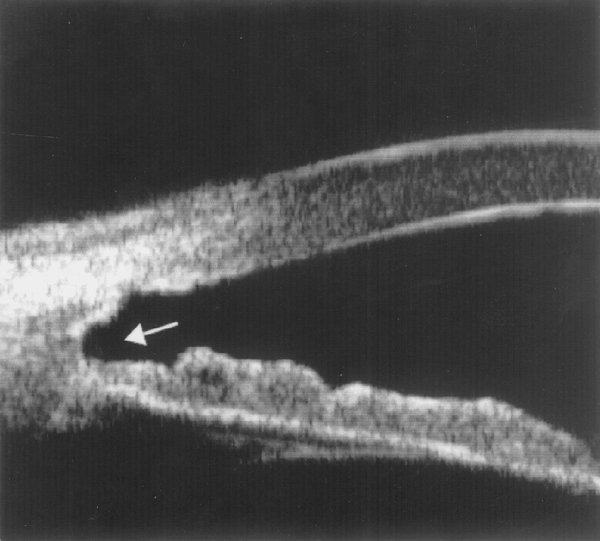 A good scan usually shows a double-arc of the cornea and the scleral spur. Pupillary block shows “iris bombe configuration” on UBM. In plateau iris, the pars plicata is wide or anteriorly positioned. This mechanically holds the ciliary body against the trabecular meshwork. The iris root is inserted anteriorly on the ciliary face so that the angle seems crowded and narrow. The AC is usually not shallow and the iris surface appears flat or slightly convex. Abnormalities in the size or position of the lens can lead to pupillary- or angle-block, which can be identified on UBM. Tumors and cysts of the ciliary body or choroid may also lead to pupillary block. 1. Malignant Glaucoma (Ciliary block glaucoma; aqueous misdirection syndrome): UBM will reveal medial or anterior rotation of the ciliary body and processes. There can also be echo-free zones in the vitreous (suggestive of posterior misdirection of aqueous). 2. 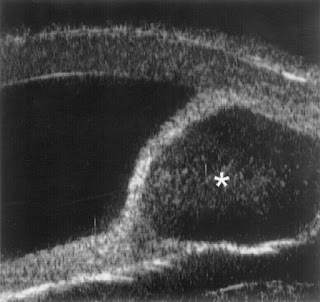 Pigment dispersion glaucoma: There is deep AC with posterior bowing of iris seen on UBM. 3. Post-trabeculectomy: UBM helps to identify the patency of the iridectomy, internal ostium, tract and bleb. Tenon’s cyst and episcleral scarring are also visible on UBM studies. 4. Ciliary body and processes: Supraciliary effusion is seen on UBM by the presence of fluid in the supraciliary space with medial rotation of the ciliary body leading to partial angle closure. In chronic uveitis, cyclitic membranes and traction to the ciliary body can occur. 5. 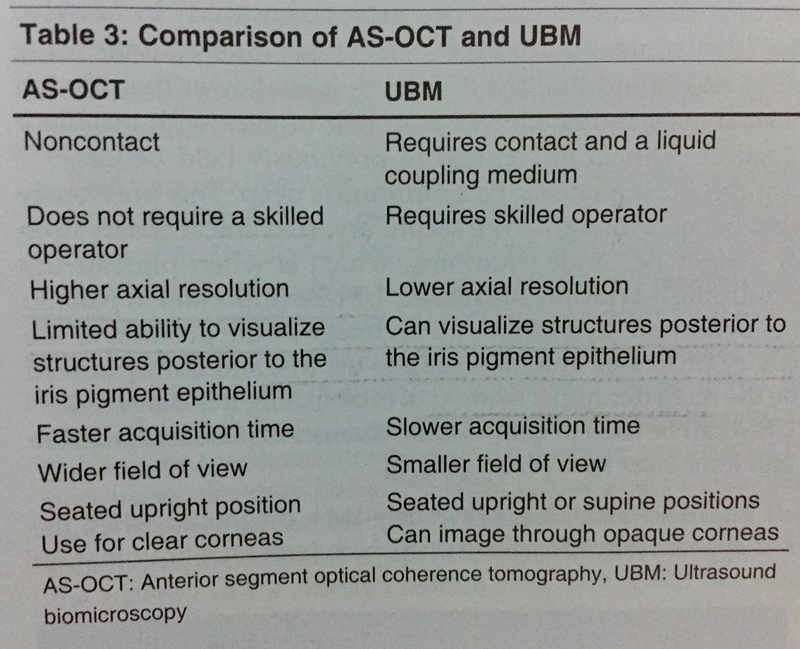 IOL-related: UBM helps to identify the position of the optic and haptics of the IOL. The haptic may also be in contact with uveal tissue leading to chronic inflammation and development of “UGH syndrome”. 6. Trauma: Traumatic angle recession appears as a deep angle beyond the scleral spur and tear of ciliary processes. Cyclodialysis cleft is seen as communication between the supraciliary space and AC. The exact extent of zonular dialysis or stretching can be determined by UBM. It can also reveal “occult zonular damage” and non-metallic foreign bodies. UBM cannot visualize structures deeper than 4 mm from the surface. It cannot be performed when a full-thickness corneal/scleral laceration is suspected/present. When using the immersion system it requires the patient to lie down. Has a narrower field of view compared to AS-OCT. There can be inter-observer variability in measurements. OCT technology was initially (in 1991) used to produce images of the posterior segment of the eye by using a wavelength of 820 nm. In 2001, the wavelength was altered to 1310 nm to allow better penetration through light-retaining tissues such as the sclera and limbus and to improve visualization of the anterior segment. In our hospital the Zeiss Cirrus HD OCT is available. 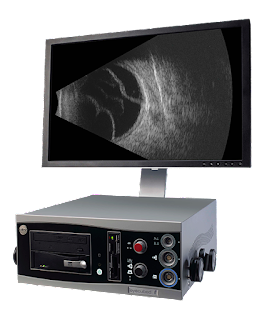 AS-OCT is a non-contact, rapid imaging system which uses “low coherence interferometry” to obtain cross-sectional images of the anterior segment. The technique has good reproducibility. Like the UBM, this technology allows the user to evaluate the 4 forces which might be responsible for angle closure. Compared with UBM, this technology provides a higher axial resolution (18 um versus 25 um in 50 MHz UBM) and faster sampling rate (2.0 kHz versus 0.8 kHz). AS-OCT provides better diagnosis of angle-closure due to the ease of it’s use, non-operator dependence and objective measurements of important quantitative data. AS-OCT parameters important in diagnosis of angle closure include: “Smaller AC width, area and volume; larger lens vault; greater iris thickness, curvature and area”. In cases, the angles do not open following iridotomy, nonpupillary block mechanisms (i.e., plateau iris, lens-related anterior rotation of the iris) can be easily identified. The characteristic iris configuration and thick profile in plateau iris syndrome is visualized by the AS-OCT. Practitioners can also observe blebs and implants by scanning the affected tissue. AS-OCT allows the practitioner to view the anatomical angle features in both light and dark conditions, thereby allowing a better evaluation for possible angle closure. (OCT is done in light, then the light is turned off for a few minutes and AS-OCT done again). Peripheral iridotomies (PIs) can be visualized on AS-OCT for their size and patency. Also, angle widening after PIs can also be demonstrated by this technique. The image acquisition can be affected at times by the superior eyelid, and oblique angles may allow cross-sectional images. Image distortions may result from off-axis measurements, requiring special software correction to eliminate the influence of scanning angle and refractive index of the cornea. Lack of a coupling medium may also affect the image quality due to abnormalities in the anterior surface of the eye. AS-OCT is unable to visualize pathology causing primary or secondary glaucoma including trabecular pigment or narrow bands of peripheral synechiae. The Pentcam (Oculus, Lynnwood, WA) uses a rotating Scheimpflug camera to provide a 3-dimensional image of the anterior segment of the eye. Advantages of this system include a noncontact, rapid image acquisition and measurements of anterior chamber depth and volume, corneal thickness, and lens thickness. However, it does not provide detailed information of the angle recess because of light-scattering and has limited application in documenting angle closure. 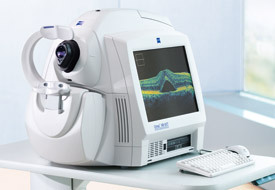 The EyeCam (Clarity Medical Systems, Pleasanton, CA) was originally designed to obtain wide-field photographs of the retina in pediatric cases. However, the modified optical technique can be used to assess the anterior chamber angle. Good agreement between EyeCam and conventional gonioscopy findings has been reported. The major advantage of this technique is its ability to visualize the angle in its entirety, compared with UBM and AS-OCT that provide only cross-sectional views. The disadvantages include lack of quantitative analysis, expense, supine position for exam, longer image acquisition time, inability to perform indentation gonioscopy, and influence of fiberoptic light source on angle recess assessment.